Christmas is over and there are just 4 days for 2012 to end. Its simply amazing how fast the time has flown by. This year has certainly brought many good memories, sprang up some unexpected surprises and few bad memories which I wish to completely forget and pray they never ever happen again. Come early January and its again the time where we come up with our New Year resolutions. Its the sudden burst of motivation and excitement that a new year bestows upon us. A "New Year Resolution" is notoriously well-known to be short-lived where its soon forgotten within first few weeks and the guilt of it starts to set in soon after But, I think its imperative to be more realistic & flexible while choosing the "right" resolutions. Identify the hardships that you are likely to face and have a good, feasible plan to counter them. Most importantly, have fun while you are at it, in whatever you decide to do. It normally takes 21 days for a person to get habituated to anything. Take a day at a time and don't be hard on yourself. 2012 has taught me one thing for sure, that life is too short to be taken seriously and to brood upon, when my dad met with a fatal accident & when a very dear one got diagnosed with breast cancer. Life was perfect one day and the very next day everything was a mess! Pasta with Chickpeas, herbs, garlic and chillies. 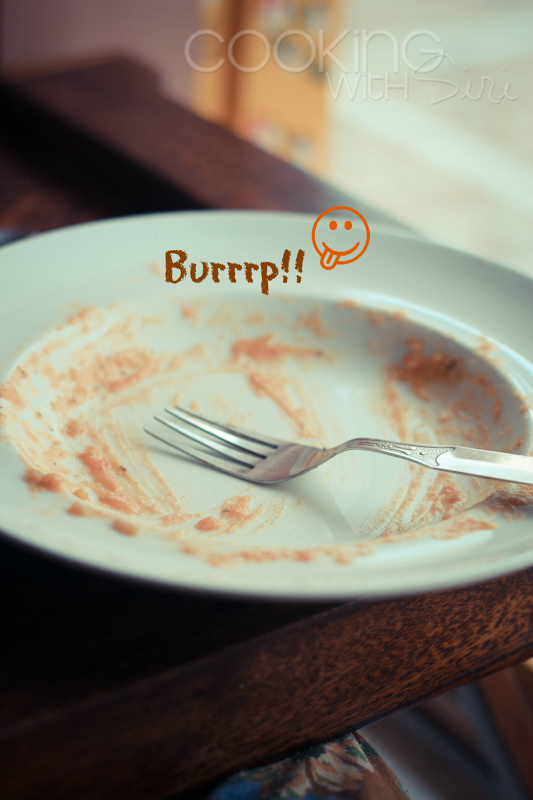 One of my other resolutions for almost every year to "eat healthy", with yummy flavors, protein-rich and good-carb food. Today's recipe falls into that category. It has chickpeas, pasta, lots of herbs and spicy kick to it. fistful of dry pasta of any kind. I used farfalle. *Note**: Soak 2 cups dry chickpeas over night in filtered water and then pour water until they are fully submerged, pressure cook on HIGH heat for 9-12 minutes. Let the pressure be released naturally and there you have boiled chickpeas ready for use. I normally cook at least 5-6 cups and freeze them in small portions. When required, all you have to do is thaw and they are ready for use. 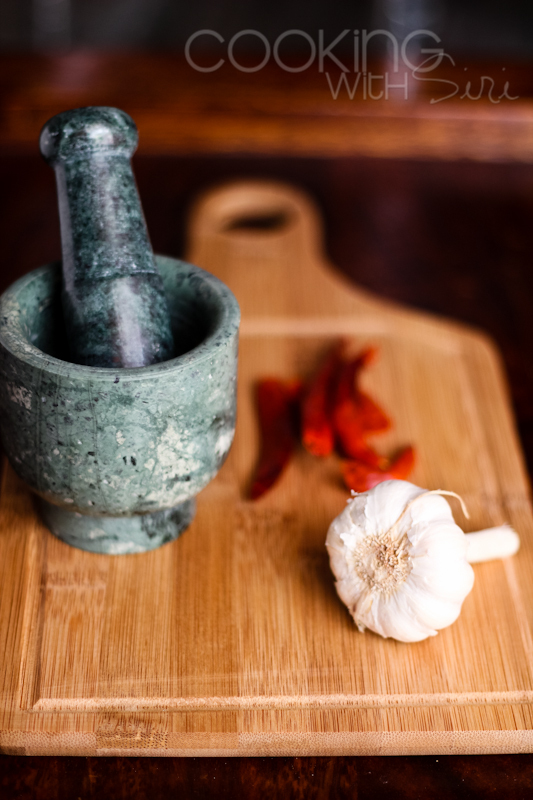 For Chilli-Garlic paste - Soak red chillies in boiling water for 30 minutes so that they soften a bit. Drain and roll them in paper towels. 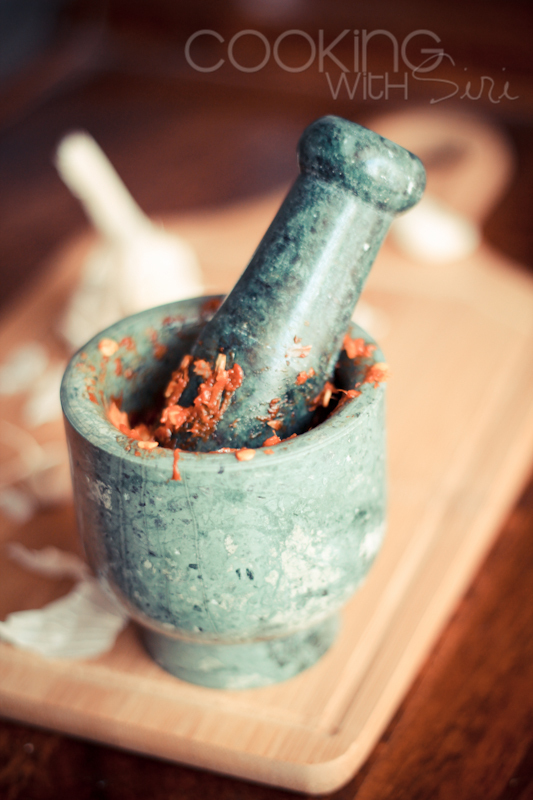 In a mortar and pestle, coarsely pound chilies with whole garlic clove and a 1/2 tsp of salt. For Chickpeas - Cook chickpeas as per the *Note* above. Save some liquid in which they are cooked in. Reserve half of boiled chickpeas and puree the rest with its own liquid along with salt and cilantro. 1. Heat olive oil in a pan and add minced garlic (if using). Then add little chilli paste (I added about 1/4 tsp). The recipe doesn't require the entire amount pounded. Save rest in an air tight container. 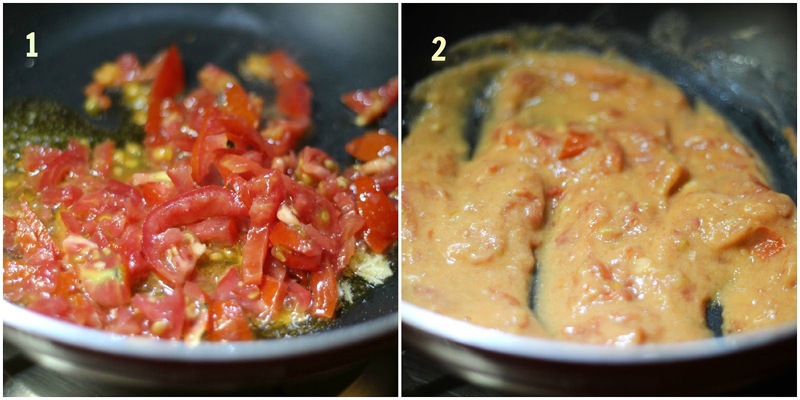 Add tomatoes and cook until they break down. 2. Mix in the chickpea puree. Season with some salt if necessary. 3. 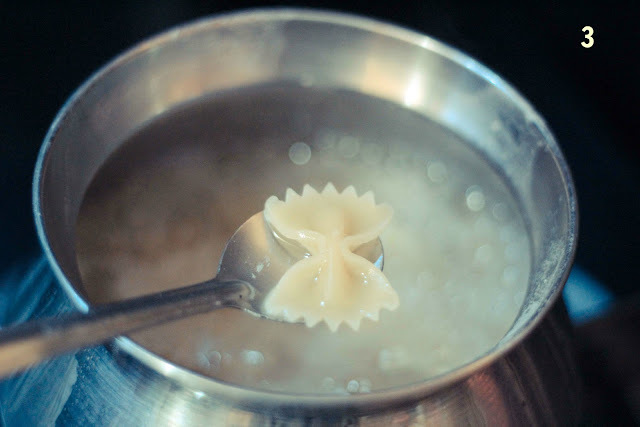 Boil the pasta until al dente. Add some pasta liquid to the sauce, if its too thick. 4. Drain pasta in a colander and add to chickpea sauce. Add the reserved whole chickpeas and toss gently. Check for the seasoning. 5. Sprinkle herbs and Serve immediately. During this happy holiday times, bring a smile and make difference into these kids lives at Vaidehi Ashram. Donate and lend a helping hand for their bright future. More details - Click here. Happy Holidays Folks! See you all next year.. 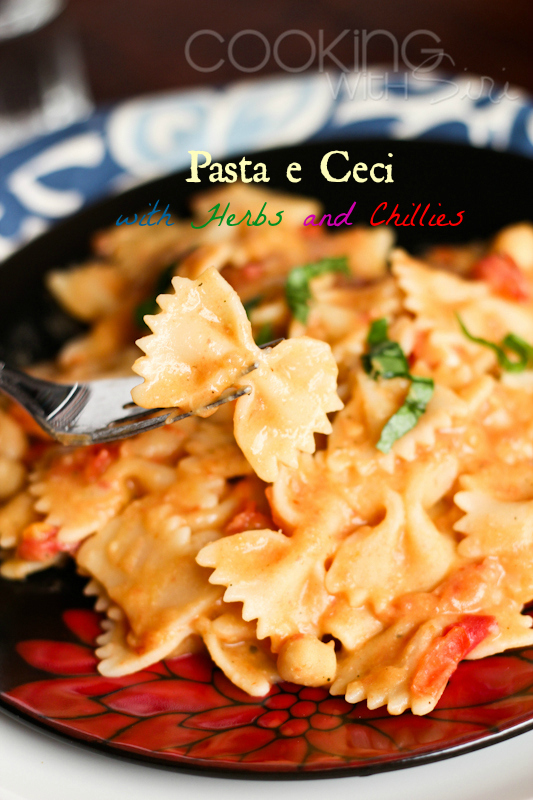 Very nice rendition of classic pasta e ceci. Best wishes for the New Year, dear Siri! I'll bet basil and cilantro tasted great in this. Love that you tried it that way. I wish you the best for your blogging endeavour for 2013. I know how hard it can be. But I'll be reading along with every post! first time here. Nice space you got. do visit mine too. so yummy and healthy.. Will try soon.